Tactical comfort, never too hot to handle! A sure grip, ready to saves your hands from a FLASH of heat. Tough U.S. Military quality for your daily operations. Supple goat leather for flexible comfort. Cut, heat and flame-resistant Aramid synthetic for protection in an emergency. Water-resistant too, for comfortable hands even in bad weather. 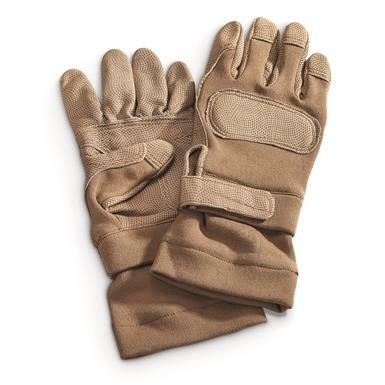 Action-packed Gloves made to strict U.S. military specs! Won't let you down in any encounter. These Gloves are reinforced in the palm and padded around the knuckles for extra protection where it counts. Extended cuffs even guard your wrists from attack. No cheap tactical knock-offs, the U.S. military had these made to survive in adverse combat environments around the globe. Our jaws dropped when we saw the price, its hard to even find quality like this let alone for an incredible surplus deal. Grab your pair right here! Built for action, ready for assignment!